Did you know that Singapore is home to over 2,000 plant species, 65 mammal species, and 109 reptile species? An estimated 384 species of birds, 318 species of butterflies and about 255 species of hard coral species also call this little red dot home! To protect and conserve our rich biodiversity in a densely populated city state is no easy task. The Nature Conservation Masterplan (NCMP) was announced in June 2015, setting out the course of Singapore’s biodiversity conservation plans that will be reviewed every five years. This framework consolidates NParks’ focus of systematically coordinating, strengthening and intensifying efforts in biodiversity conservation by integrating various programmes and projects into a holistic masterplan. Building on the NCMP, 46 species of terrestrial and marine native flora and fauna have been identified this year for species recovery efforts. All are classified as threatened under the Singapore’s Red Data Book and found in isolated habitats where they are vulnerable to external threats. These include 31 plant species, seven terrestrial fauna species and eight marine species. Recovery efforts, spanning the next two to 10 years, will be implemented to protect and safeguard these rare and endangered native species. Learn more about five of these species here and what you can do to help conserve our amazing biodiversity. Also known as the scaly anteater, this solitary mammal can be found in our nature reserves and forested areas, but is rarely seen. It feeds exclusively on ants and termites, using its fore-claws to rip open their nests before using its long sticky tongue to lap up its prey. The brown scales of the Sunda Pangolin are made of keratin, the same material found in our hair and fingernails. When threatened, the pangolin curls itself up into a ball, and the young of this mammal are also known to take ‘piggyback’ rides by clinging onto their mother’s tail as she moves through the forest! While the population of the Sunda Pangolin is considered stable in Singapore, it is Critically Endangered globally due to poachers who hunt it for its meat and scales. NParks is part of the Singapore Pangolin Working Group which carries out initiatives such as tracking, rescue and translocation, genetics research and a captive breeding programme. 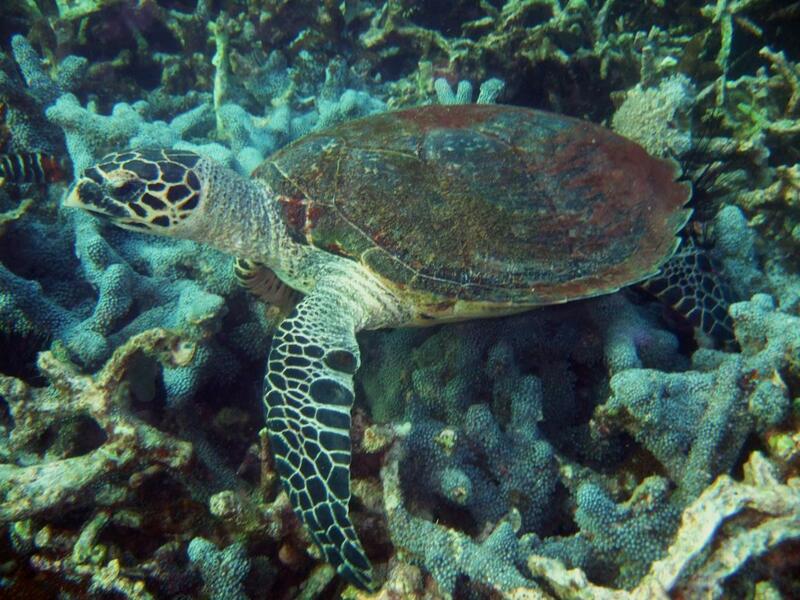 Named for its tapered head and bird-like beak, the Hawksbill Turtle (Eretmocelys imbricata) is one of the smaller sea turtles found primarily in the coral reef habitats of tropical waters such as in the Atlantic, Pacific and Indian Oceans. These globally Critically Endangered turtles’ diet consists of sponges, seaweed, squid and shrimps, playing an important role in promoting the health of coral reefs ecosystems. How so? By feeding on the sponges, this prevents sponges from dominating reef communities, and in the process competitively excluding corals which serve as key habitats for other marine life. Turtles visit Singapore’s sandy shores throughout the year to lay eggs. At least 10 sightings of such incidents have been reported along East Coast Park and Changi Beach since 2012. And by end 2017, Singapore’s first sea turtle hatchery which will be developed through a $500,000 donation from HSBC, will be set up at the southern lagoon on Small Sister’s Island. The hatchery will allow researchers to study local sea turtle populations and educational outreach programmes will be developed to raise the awareness of the turtles. If you observe any turtles laying eggs, please contact NParks at 1800-471 7300, or ACRES at 9783 7782. Giant clams are the world’s largest living bivalves (or molluscs with a compressed body enclosed within a hinged shell), growing up to 1.2 m long and weighing over 200 kg! They serve as food for coastal communities, as shelter for small invertebrates and as reef-builders. Due to over-harvesting and habitat loss, two out of five species of giant clams are now extinct in Singapore while the remaining three occur in very low numbers. The gigas clam is also globally threatened. Juvenile giant clams are bred and raised ex situ to be transplanted onto local coral reefs. Protocols have been established to optimise their spawning, fertilisation, larval and juvenile rearing, as well as transplantation. To date, the clam hatchery has cultured five successful batches of juvenile giant clams since 2012 and restocking is underway at various coral reefs, including those at the Sisters’ Islands Marine Park. The male Pixie (left) and the female Pixie. The Pixie was first recorded in Singapore in 1854. For over a century, this diminutive dragonfly species was not spotted until its rediscovery at a single site in the Western Catchment Area in 2007. The Pixie favours shaded ponds with a substrate of leaf litter and debris. Although the Pixie has been observed in Singapore since 2007, it is restricted to a small forested pond in limited numbers. Unpredictable natural or man-made events can still lead to local extinction. NParks has started population surveys within the Western Catchment Area to determine the species distribution at the site. Its larvae can now be conclusively identified, and translocation trials are underway to selected ponds in our nature areas, with plans to expand the translocation programme to a wider network of parks. Sponges are the simplest type of multicellular animals. Being sedentary, they constantly filter seawater to feed and obtain oxygen. The first sponge species to be described from Singapore in 1820 is the Neptune’s Cup Sponge, named after its distinctive goblet shape. This sponge can reach up to 1 m in height and diameter, and was so highly sought after by collectors that it was thought to have gone extinct by the early 1900s. In 2011, it was discovered off the coast of Singapore. Following this, NParks officers and partners at the Sisters’ Islands Marine Park discovered three new individuals, bringing the total number of locally known individuals to five. This is the largest known population of the Neptune’s Cup sponge in the world. The Neptune’s Cup Sponge was successfully transplanted to the Sisters’ Islands Marine Park in 2015, with a second successfully conducted in August 2016. By moving several individuals to a suitable location, this can better safeguard the species and increase opportunities for the sponge to reproduce. Volunteer your time and energy with one of our many programmes including conservation efforts like plant propagation or reforestation (https://www.nparks.gov.sg/contribute/volunteer), or sponsor the planting of a tree or the seeding of a coral reef (https://www.nparks.gov.sg/contribute/sponsor) under the Garden City Fund. You can also join in one of the many Community in Nature (CIN) initiatives with the objective of conserving our natural heritage. Do it at your own pace – whether as a casual observer or an active participant in conserving our biodiversity (https://www.nparks.gov.sg/biodiversity/community-in-nature-initiative). Learn more about Singapore’s plan for conservation (https://www.nparks.gov.sg/biodiversity/our-national-plan-for-conservation) as well as discover our amazing wildlife (https://www.nparks.gov.sg/biodiversity/wildlife-in-singapore).